San Jose resident Joe Bell, who served in World War II and became a viral video star in 2014, has died at the age of 95. SAN JOSE, CA -- A 95-year-old World War II veteran who became a viral video star has died. 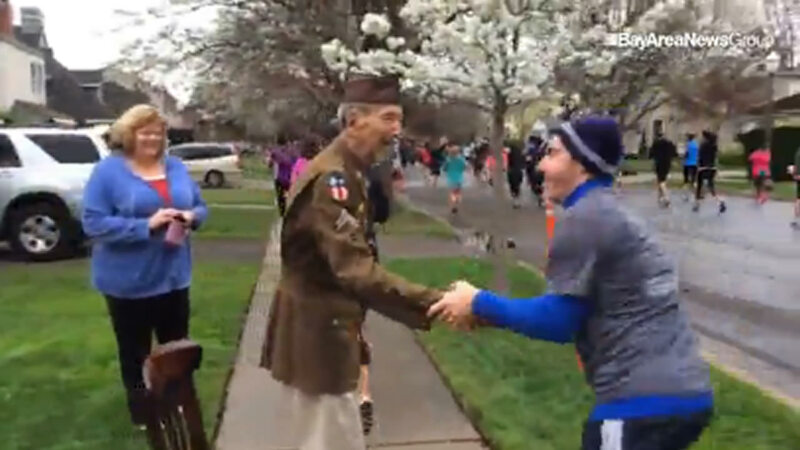 Joe Bell became famous after video surfaced, showing him wearing his uniform while cheering on runners as they passed his house during the 408K marathon in San Jose last year. One by one, the runners approached him to stop and thank Bell for his service. Since then, he's been interviewed repeatedly. ABC7 News and Good Morning America spoke with him last year. The San Jose Giants even created a special trading card for him, honoring veterans. Bell died Thursday at his home in San Jose. His family says his heart gave out. Our media partner, the San Jose Mercury News, says the family is planning a memorial luncheon in his honor from 1 to 4 p.m. Jan. 17 at Vahl's Restaurant in Alviso.